With Game Day this week, we’ll look at some important district match-ups at the 8-Man level, peek at a rivalry game, look at some conference and individual milestones, and even put a team on upset watch. If you have suggestions for what you would like to see in future Game Day features, send us a message on Twitter or Facebook. The Cougars, ranked No. 3 in Eight-Man, Division II, have a huge road opener at Wallace County, who dropped out of the poll after two season-opening losses. This marks the first opening salvo in Eight-Man, Division II, District 6. This district also includes Hodgeman County (3-1) and Dighton (4-0). Last year, the Cougars and Wildcats met up in the first round of the playoffs and Wallace County defeated Otis-Bison at home, 65-20. However, Wildcat senior Luke Schemm collapsed on the field and then passed away shortly thereafter. Otis-Bison is heavily banged up, while Wildcat standout Grady Hammer has returned after missing two games. A key player is Wildcat quarterback Levi Johnson, who battled Hammer for the quarterback job in the summer and then took over under center after Hammer was hurt. Johnson and his brother, Seth, have transferred in from Tribune-Greeley County and look to help the Wildcats shift back into the top-5 and continue their streak of reaching the playoffs every year since 2007. Wallace County has not allowed more than 26 points in a regular season game since a 36-28 road win at Hoxie in Week 2 of 2013. The last time the Wildcats permitted more than 30 in the regular season came in a 50-44 road win versus Golden Plains on Oct. 15, 2010. Otis-Bison has not won a regular season contest while scoring under 30 points since a 22-20 home win versus St. John to open 2012. The Cougars have lost their last 12 regular season games when they score under 30 points. This marks the third meeting between Wallace County and Otis-Bison in the last seven years, and the first time in the regular season. The home team has won both prior contests. Eight-Man, Division I, District 4 features two huge matchups. Logan-Palco junior running back David Thompson has 94 carries for 874 yards and 17 scores. Victoria has regrouped from a Week 1 loss to Central Plains, to win two of their last three games. Junior running back Collin Kisner has 11 touchdowns and 477 rushing yards in the last three games. Logan-Palco opened 6-0 last season before a 1-2 finish that included two losses by a combined score of 98-18. Logan hasn’t made the playoffs since 2002, Palco not since ’06. Victoria has reached the postseason 14 consecutive years. From 2006-11, Victoria combined for a 13-0 record versus Palco and Logan, including wins versus several strong teams. In ’06, the Palco Roosters made the playoffs but lost 36-0 to Victoria. In 2010, Palco went 6-3 and played with Victoria for a half at home. In the second half, the Knights outscored Palco 28-0 for a 68-26 win. In 2007-08, Logan finished 9-9 and averaged 43 points a game behind standout running back Levi Kiser. However, Victoria defeated Logan, 42-6, in ’07 and 56-8 the following fall. Victoria has not lost to a non-Central Prairie League team in the regular season since a 46-0 loss to Thunder Ridge in Week 9 of 2011. The Knights have lost just once in district play since. Solomon coach Steve Tiernan will host his former team and assistant when Osborne travels east to take on the Gorillas. Tiernan led Osborne to 10-2, 6-3, 13-0 and 10-2 marks before he left for Solomon a few months before the 2015 season. At that time, John Scarbrough moved to Osborne and led the program for a year. Now, Scarbrough is the assistant, and Cullen Riner is back as head coach. Riner served as assistant under Tiernan and was previously head coach as Osborne went 10-2 in 2010. These two teams have not played each other since 2004. Junior Denton Schurr (450 rushing, 10 rush TDs) and senior Cullen Grabast (383 rush, six rushing TDs) lead the Osborne offense. Osborne has rushed the ball 83 percent of the time for 6.9 yards per carry. Junior Jake Harmon (462 rushing) and senior Nathan Webb (383 rushing) have led the rushing attack for Solomon. The Gorillas have rushed the ball 72 percent of the time for 7.6 yards per carry. Solomon is 13-3 under Tiernan, who led the Gorillas to a sub-state appearance last season. However, the Gorillas are 0-1 at home and 3-0 on the road this season. Last year, both of Solomon’s losses came at home. Solomon is 8-0 on the road and 5-3 at home since the start of 2015. Granted, the three losses have to come Central Plains and Spearville last season and Herington this year, but the margin of losses have been 32, 32 and 16 points. The Gorillas have allowed 57 points a contest in those defeats. This will be the first matchup for the Panthers against the Railers since 2011. The teams offer a bevy of skill players, including running backs Kirk and Mark Coomes and quarterbacks Trey Sides in the backfield for Phillipsburg, and Ellis’ experienced trio with quarterback Easton Smith and running backs Dalton Hensley and Joseph Eck. Railer running back Clay Feik is expected to be out with injury. Phillipsburg has won 11 straight contests. A win would essentially give Phillipsburg the Mid-Continent League title. Phillipsburg last won the MCL crown outright with a 4-0 record in 2013. 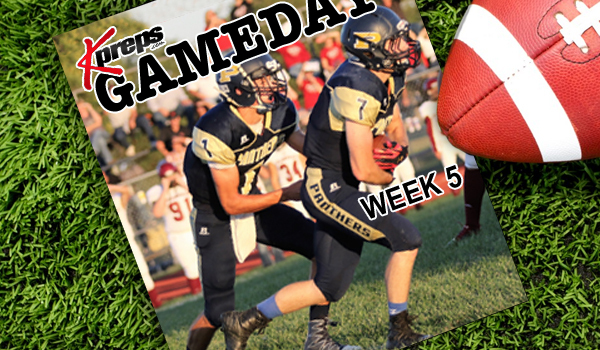 Last season, Norton (5-1), Phillipsburg (4-1) and Smith Center (4-1) shared the title. Phillipsburg has not lost to a non-Norton team in MCL play since a 46-17 loss to Smith Center in Week 2 of the 2011 season. Smith, Ellis’ three-year starter at quarterback, has completed 181 of 395 attempts for 2,885 yards with a 34/15 TD/INT ratio in his career. He has played in 28 career games. Smith bested the MCL career record for passing yards held by Norton’s John Tacha, who threw for 2,767 in 1981-82. As well, Smith will likely best Dusty Trail’s completion record this week. Trail had 184 completions from 1980-83, according to MCL archives at mclhighschool.com. Trail is the longtime offensive coordinator at Bishop Carroll. The Indians are 3-10 under second-year coach Randall Rath, though have scored two significant upsets and posted solid defensive numbers. Last season, Hays was 1-3 but shutout then undefeated Wichita South, 16-0, on the road. This year, the Indians came back to defeat Scott City, 31-21, in Week 1. Hays has not won a home game under Rath. However, the defense has permitted 27.8 points per game and held each team under its season scoring average, including a 35-14 Week 2 road loss to rival Great Bend in a tie game at the half. Great Bend has averaged 50 points a game in its other three contests. If senior standout Shane Berens can play – he didn’t last week versus Garden City – the Indians could pull the upset on Homecoming. Valley Center, expected to be much improved, is one of four undefeated teams left in 5A, along with surprise Topeka Seaman. However, the Hornets have averaged 28 points a contest and had all wins by under 30 points. Valley Center does rank No. 1 in 5A in scoring defense with 23 points allowed. Hays has played the No. 2 SOS in 4A-I, significantly harder than Valley Center’s No. 25 in 5A, according to Prep Power Index. Valley Center junior Aaron Coash’s leg was huge in 2015 wins versus Andover and Arkansas City. This year, he is 3 of 4 on field goals with a long of 45. He is tied with Atchison’s Austin Bonnel for most field goals and longest FG this season. The junior recorded his first two touchbacks of his career this season. Overall, Coash has connected on 26 of 28 on extra points and 8 of 10 field goals in his career. The Lewis Field Stadium turf could yield some big kicks for Coash in an expected low-scoring game. Who will exceed 1,000 yards? – Generally, Week 5 marks the first time Kansas has a 1,000-yard rusher. This week, multiple rushers could clear the milestone with big games. KC Schlagle’s Cornelius Ruff leads the state with 877 yards, followed by Logan-Palco’s Thompson with 874, according to MaxPreps. Dodge City junior Dawson Williams has 800, and Santa Fe Trail senior Peyton Newton has 796. Then, Labette County senior Isaiah McPherson has 796, followed by Rossville senior quarterback Jacob Bradshaw (752) and Hoisington senior standout Hunter Hanzlick (752). Satanta sophomore Gabriel Salas has opened the season 10 of 21 for 130 yards with a 6/0 TD/INT ratio. As well, he rushed 65 times for 699 yards and 12 scores. In every game, Salas has carried the ball less than 22 times but exceeded 116 yards in each contest. He also rushed for two scores in each contest. Last year, he had just 165 rushing yards for the season. Troy was the first Kansas team to clinch a playoff berth in 2015. This week, the Trojans, 4-0 and ranked No. 1 in Class 2-1A, face nearby Doniphan West (0-4) to open Class 2-1A, District 1 play. Troy has won 11 straight regular season contests. Additionally, the Trojans are 10-1 in its last 11 district games. Troy has won the last three against its rival by scores of 34-15, 49-0 and 46-19. Troy’s offense has been very consistent, even with two victories by a combined 20 points the last two weeks. Troy has averaged 46 points a game in 2016 after 43 a game in 2014 and 42.1 last season. Hanover (3-0) has outscored opponents 120-0 and is the lone Kansas team to not allow a point. Last season, Hanover had four shutouts, including back-to-back in Weeks 3 and 4. The Wildcats have eight shutouts in the last three years.